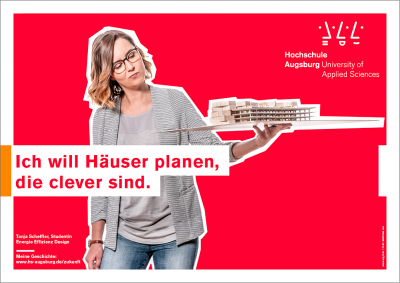 Skip navigationDirekt zur Navigation von "Architecture and Civil Engineering"
Die Studiengänge "Energieeffizientes Planen und Bauen/ Energie Effizienz Design - E2D" sind Teil der Zukunftskampagne der Hochschule Augsburg. Klicken Sie auf das Bild für die Reportage über die E2D-Studentin Tanja Scheffler: Ich will Häuser planen, die clever sind! To do so, architectural and engineering elements are combined. The classical design processes for buildings and urban development contexts involve aspects of design, construction and profitability not to mention building typology and social interaction. They are now complemented by the factors of building physics, building services and environmental accounting. These additional factors are, by way of intensive study, understood to be an integral part of a cybernetic design process. Taken continuously into account, they can have an impact as early as the initial planning phase. Here crucial groundwork with respect to sustainability is laid. Students receive practical and process-oriented instruction using a number of specific projects. A networking and system-oriented approach is also mirrored by the interdisciplinary nature of the teaching staff. The up-to-date processes and methods taught enable the students to use these interacting relationships expertly in planning processes and consultations. They can adapt quickly to changing requirements with regard to resource-efficient planning. As such, this is a trendsetting degree program. Our graduates will have sought-after personalities.